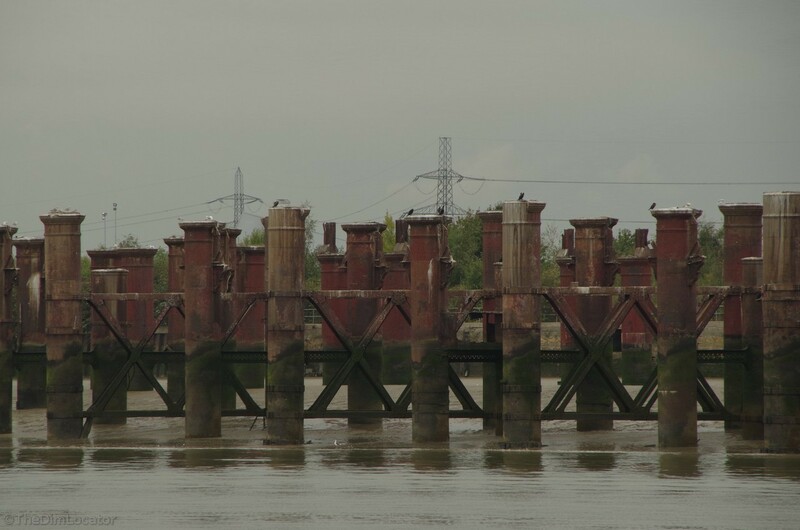 Beckton Gas Works jetty piles, they have tried to remove them but they can't shift them. 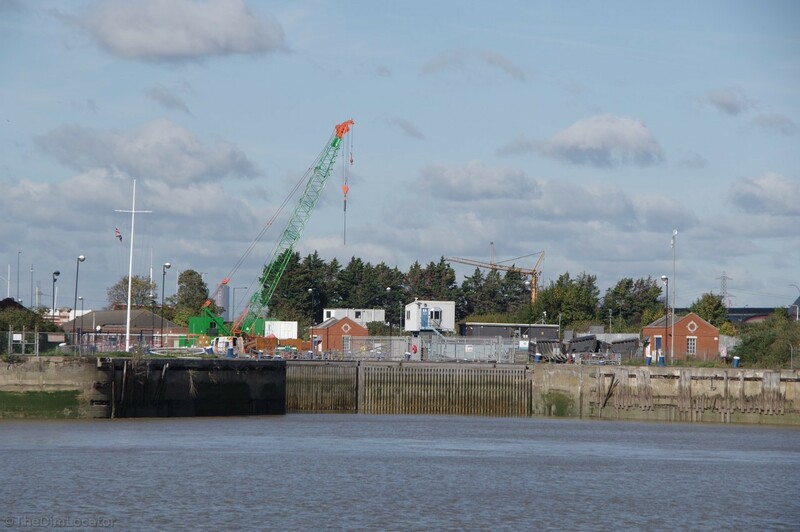 Royal Albert Dock former lock entrance, now a marina in the basin beyond. King George V lock entrance, still operational, gateway to Essex. 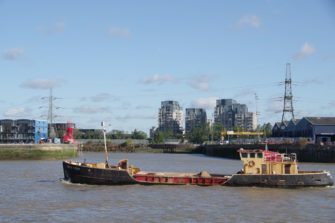 James Prior, has sailed down the Esssex coast from The Colne and is passing Bow Creek, with Essex on the right bank, Middlesex on the left. 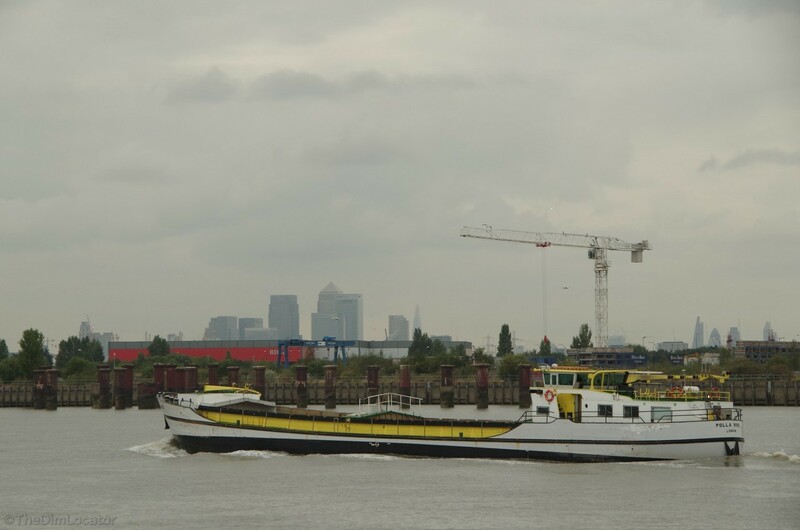 Polla Rose passing the former Beckton Gas Works coaling jetty, the tall buildings on The Isle of Dogs and beyond in The City are in Middlesex, The Shard is south of the river in Surrey and Essex lies somewhere in between. Mark E Smith of The Fall was once able to boast, “There are no ex members of The Fall in The Fall.” In that spirit I’ll coin, “There are no parts of Essex that used to be in Essex,” apart from that bit which is in Kent. The commentary on The Waverley doesn’t mention that Gallion’s Reach from Barking Creek across the former Beckton gas works site, over the three Royal Albert and King George V lock entrances and round into Woolwich Reach, and again in Woolwich Reach for a short distance covering the old North Woolwich Pier and the free ferry terminal, are traditionally a part of Kent that spans The Thames. Hamon Dapifer, who was the sheriff of Kent around about the time of Domesday, held these detached parts. 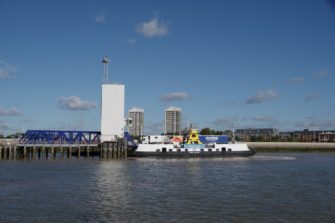 It may have been a land grab, but it’s more than likely it was a situation that existed previously, so, in this recording passengers go from Essex to Kent, Kent to Essex, Essex to Kent and finally Kent to Essex before heading past Tate & Lyle’s, towards the flood barrier and onto Middlesex and Surrey. 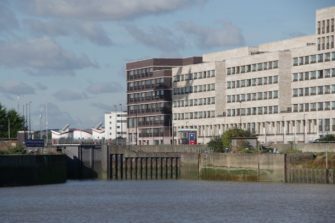 The aircraft you hear going into City Airport is flying in over Plumstead over the Royal Docks’ lock entrances before landing on the runway in Essex. The photos were taken over various years. 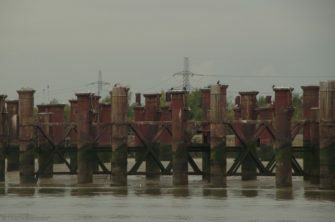 I’ve just finished reading the Geoff Marshal book, “London’s Industrial Heritage” it mentions that The Courts of The GLC resolved in 1868 that The Gas Light and Coke Company, their new works and property near Barking Creek should henceforth be known as Beckton, after their governor Simon Adams Beck. 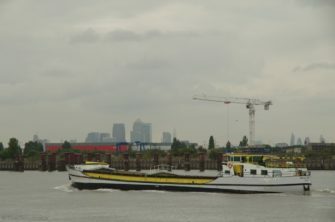 London has a long and varied industrial history, greater than many towns and cities known for their industry and of course a lot of that would have spilled out of Middlesex into Essex, Xylonite in Walthamtow, Berger Paints in Chadwell Heath, various chemical, oil and lubricant plants in Silvertown, May and Baker in Dagenham, Jeyes’ in Plaistow Yardley in Stratford which moved to Basildon, shipbuilding in Bow Creek, locomotives in Stratford, early aviation in Clapton all with their own distinctive sounds (and smells) I’m sure. Indeed! Would that we had some sound recordings surviving from then. Some of those factories in East London which would have had very distinctive smells were food flavouring manufacturing companies, which eventually merged into Bush Boake Allen Ltd: https://www.youtube.com/watch?v=rmIJ4HSI5B8.